The crash of Wall Street in 2008 brought us the “Great Recession” the most serious economic downturn since the Great Depression. The effects of the recession were long-lasting especially for people who were divorced in that period. Many of those families had no equity in their homes, and re-building a life became a process that took a long time. People became financially stuck with each other. Homes were left with mortgage balances that exceeded the equity in the Home. The Homes couldn’t be sold unless the parties had cash savings to pay the mortgage lender. Homes couldn’t be refinanced because the loan-to-value ratio negated that possibility. Many of those divorcing families continued to co-own their home on an ongoing basis with one party keeping the Home because he or she could afford it and the other party could not. The other party was left tethered to the mortgage for an indefinite period. Today, 10 years after the recession, most of those couples have financially detached from each other as home prices recovered. It is strange but true that tragedies often produce unintended positive consequences. The Great Recession is no exception. The dire financial environment caused many couples having family law disputes to turn to the more cost-effective process of mediation for separation, divorce, child custody and child support matters in Maryland and around the country. The professional mediator will help families begin the process of rebuilding the family structure. Together they can plan for a new future and figure out how to de-escalate the rage and hurt to resolve the issues which are so pressing. A more difficult situation, like a recession, may call for carefully crafted and creative resolutions. There are many solutions that a court does not have the authority to consider or order. People who have “skin in the game” by participating in the rebuild become emotionally invested in success of what was built. No one wants to be ruled by a Court Order. No one wants to be bullied by a hired-gun aggressive attorney. Being bullied into an agreement might actually make an acceptable result feel unacceptable. Resentment takes on a life of its own. Separation, divorce, or custody mediation under the supervision of a neutral professional allows the parties to find the way to the other side of conflict with a resolution that feels tolerable. Those “lucky” enough to be hit hard in the recession learned that there was a better way to divorce. They learned what the courts know- that most child custody matters belong in mediation until resolution is reached. Take the next leap of logic and realize that most family law matters would benefit from mediation. Parties’ without the financial resources to finance $50,000 of litigation were left with no remedy except to voluntarily exchange of financial information, use calculators and common sense to resolve their children and property conflicts. They learned the benefit of leaving the past behind in exchange for a focus on the post-divorce future. The recession forced nervous parents to focus on the children’s needs. The extrinsic threat of the terrible economic environment made couples less focused on the interpersonal angst. 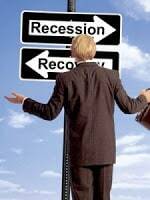 The Great Recession is over for now. But it’s too late- too many people have realized that negotiating in mediation is sensible, far less stressful, economically efficient and emotionally tolerable. You can’t say any of that about litigation. When you face the terrible choices arising from family law issues, the first decision you will make is whether to choose an adversarial negotiation process or a settlement process. Is your hope to escalate the animosity or to subdue the animosity? Is your desire to wallow in the failings of the past or to be able to begin to visualize the future? Many people still do not understand how the mediation process works. You don’t need to be in a recession to take a cost-effective approach. Most families are in financial crisis at separation. To find out more, at no obligation, sign up to attend Nancy Caplan’s no cost monthly Mediation Seminar and Q&A. Learn the better way. Bend, don’t break. Mediate.